Hi, my name is Chantal and I’m addicted to foods that are a little silly and kid-friendly and allergy-friendly and easy-to-make and maybe a little sweet. 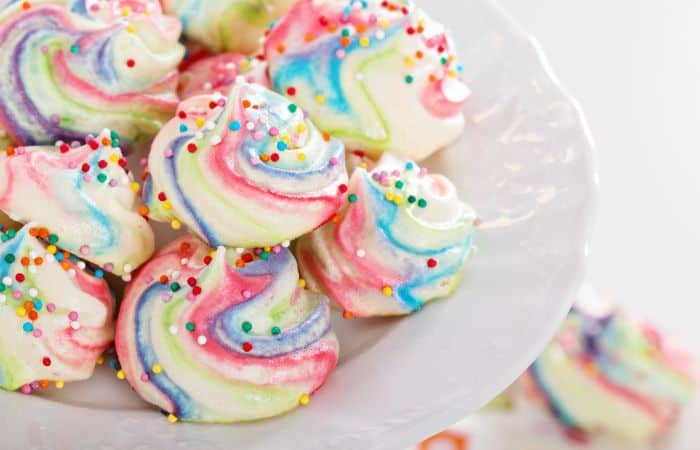 There, now that my confession is out of the way, I shall introduce to you my newest LOVE LOVE LOVE: Egg-free Rainbow Meringue Cookies. Yeah, that’s right. Meringue without eggs? Is that even possible? Yes, it is, and it’s amazingly yummy. 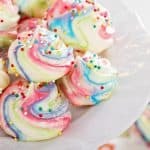 Inspired by this totally easy recipe for vegan meringue cookies on It Doesn’t Taste Like Chicken, I took a little yum, added a little fun and got a piece of the rainbow sitting on my baking sheet. Eat that, unicorns! I got my own rainbow! Neener, neener! Preheat your oven to 200-degrees. Mix bean juice (no beans, just the water), vinegar, soda, and vanilla in a large mixing bowl (preferably your stand mixer’s mixing bowl, if you have one, because this takes FOREVER to mix with a hand mixer–and you’ll be there until next Christmas if you try to do it by hand-hand with no mixer at all (sorry about this if you’re Amish)). Whip for like 6-10 minutes (a really long time). If you have to, feel free to stop the mixer to scrape the sides to make sure everything is getting fully whipped. Just keep whipping until the peaks are stiff and don’t fall over when you jiggle the bowl–like meringue. Paint the insides of the pastry bag with stripes of the food coloring. If I’m not being super clear about how to do the rainbow swirls, just check out this cool photo tutorial for making the color-swirl effect over on The Chickabug Blog (that’s where I learned to do it). I actually just let the coloring drool down the sides, since the gel food coloring I have is very fun to play with…I may have gotten carried away. Once cooled, you are required to eat them all that day…just fyi. 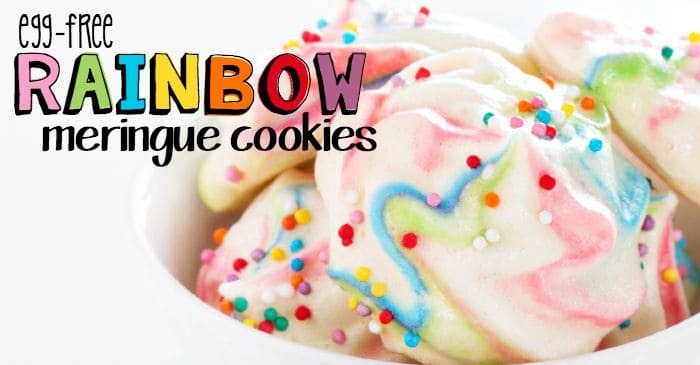 I shall introduce to you my newest LOVE LOVE LOVE: Egg-free Rainbow Meringue Cookies. Yeah, that's right. Meringue without eggs? Is that even possible? Yes, it is, and it's amazingly yummy.